The stealth Oscar winner Slumdog Millionaire, the Indian fable of love, heartbreak and overcoming the odds set against the backdrop of one of the world’s biggest urban slums has won fans all over the advanced industrial world – but may be less popular in India. One Indian film director who viewed the film at the Toronto Film Festival said flatly “All the Indian[s] hated it. The West loves to see us as a wasteland, filled with horror stories of exploitation and degradation.” One viewer in India claimed the film’s makers simply “cashed in on starvation, genocide, child prostitution, and overwhelming oppression.” Famed novelist Salman Rushdie panned the movie to an audience at Emory University after it won the Best Picture Academy Award for piling on “impossibility onto impossibility” to arrive at a contrived and implausible conclusion. The plot line — an “uneducated” slum dweller winning a million dollars on India’s version of the hit program “Who Wants to Be A Millioniare” — may well be unrealistic, but also obscures an important, often misunderstood point: the slums, themselves a product of heavy-handed land regulation and price controls, are centers of entrepreneurial activity and social stability. India’s urban slums are not just teeming masses of exploitation and degradation. The slums are populated by people that have real jobs and earn real income. They include white-collar workers, policemen, and even bureaucrats. They include tanneries, restaurants, makeshift pharmacies, tailors, cleaners, and hundreds of other micro businesses and entrepreneurs. Peeking inside one of those huts, typically less than the size of an American child’s bedroom, one will often find a small TV, radio or DVD player, purchased with legitimate income, although powered by illegal taps into the city electrical wires. The denizens of these slums are “quality of life poor, not cash poor,” as one World Bank official told me on a tour through Dharavi, perhaps the world’s largest urban slum. And this is where the story of Jamal, an orphan raised in the poverty, exploitation and harsh realities of India’s slums, tells a gripping story about India containing important lessons for the rest of the world. Unlike a generation ago, a smart orphan boy now can grow up and get a respectable job. If he (and increasingly she) is clever enough, he can run a business and even become rich. Unfortunately, this story is missing from Slumdog Millionaire. Upward mobility is not the first thing that comes to mind flying into Mumbai, India. The hills and gullies are thick with tin and wood shacks, sheltering thousands of men, women, and children. Many slum dwellers are recent immigrants from India’s hinterlands, but some have lived in these shacks for generations. Even an air-conditioned limo can’t keep the bracing poverty away from westerners ferried into the center of India’s most economically vibrant economic capital. Indeed, as soon as I left Mumbai’s airport in a local taxi, I was struck by the destitute poverty all around me. It was a visual reminder of the stories my grandmother used to tell of her travels to India as a tourist. She loved this nation and its people, but also recognized the dirt, grime, and poverty. The slums also reflect what’s going on right in India in addition to the challenges that great nation still faces. Unfortunately, by ignoring the economic dynamism within an illegal city of one million people, the movie missed out on telling India’s truly remarkable story of growth and development. Many have heard the story of software giants like Infosys, the 1.5 billion dollar information technology business founded in 1981, or about the scores of U.S. and European firms investing in India. Microsoft not too long ago announced plans to invest $1.7 billion in India and create 3,000 new jobs over four years. But the real test of India’s economic rebound lies in the small business community, especially the ones that find their way in the mainstream economy. These small businesses, popping up spontaneously to meet global needs and demand, are the ones that will eventually determine whether India will become the next Asian Tiger. Deepak Parekh is the CEO of Sureprep of India and former senior accountant for a multinational corporation. Sureprep prepares U.S. personal income tax returns, processing more than 25,000 each year. Business is booming, and Parekh anticipates annual growth of 40 percent or more. “We did a pilot project in 2000,” Mr. Parekh says as he recalls the initial stages of the company’s founding. After all, why should an Indian firm prepare tax returns for Americans? U.S. trained accountants would seem to have a natural comparative advantage. Not so. “We looked hard at the quality numbers,” he says. “We found that Indians were among the top performers and dedicated workers, willing to work 24-7 to get the job done.” American accountants made more errors on average than Indians, but were paid more and expected more time off. Sureprep now employs more than 200 Indian accountants and software engineers. Sureprep’s success — and that of India’s service sector — came about in part, oddly enough, due to socialism. Once the poster child for post-World War II socialism in the developing world, India erected one of the most regulated and protected economies in the world. Yet this legacy did not impact much of the technology sector – which largely did not exist at the time of Independence — or the largely informal sector that thrives in places like Mumbai’s slums. Dharavi, located north of the central business district and east of the airport, squeezes 900,000 people on just 2 square kilometers. That’s ten times more dense than Manhattan. 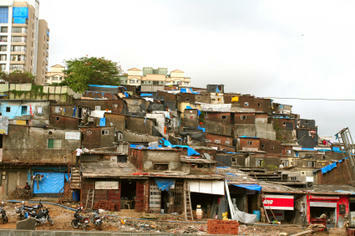 By most estimates, more than half of Bombay’s population lives in ramshackle slums such as Dharavi. Yet economic opportunity is thriving in India’s cities. The slums are large enough to have economies internal to themselves — maids, clothing repair, plastic recycling. Few are homeless. The lack of housing is evidence of a significant planning failure. Ramakrishan Nallathiga, a housing economist in Bombay, studied land use and regulation in the city’s 20 wards and found density restrictions were the strictest in the most dense parts of the city. This forced non-profit organizations to step in and build the housing themselves after securing special land development privileges from the local government where they could. However, most of the poor scramble for any sliver of land they can find to put together a makeshift home. Since private land is off limits, they settle on public land — parks, open space, railroad right of way. Meanwhile, Bombay’s population has skyrocketed 137% since 1975 to 17.1 million according to the United Nations. It’s now about the size of the New York urban area, but Bombay squeezes its metropolitan population onto about 8 percent of the space according to Demographia.com. The New York area only grew by 15 percent over the same period. The only U.S. metropolitan area among our top ten that grew near Bombay’s rate over the same period was Atlanta (188%). Miami and Houston, next in line in terms of growth, merely doubled their populations. In each of these cases, though, the metro population is less than one-third Mumbai’s. India has a lot further to go in areas other than housing as well. Many traditional industries are still shackled by labor rules that limit their ability to adapt. A World Bank analysis of the business environment found that managers reported spending 16 percent of their time with the bureaucracy in India compared to just 5 percent in Latin American countries and about 10 percent in post-Communist Eastern European countries. India’s economic future fundamentally lies in the entrepreneurial attitude of its citizens. A recent popular movie called Swapes, or “Foreign Land,” follows Mohan Bhargava, a young, talented Indian project manager for NASA who returns to rural India to build a hydroelectric power plant that provides electricity reliably 24-7. He uses the technology he developed and uses everyday to build critical infrastructure in some of the most remote areas of his native land. Our bright, talented Indian hero has the knowledge, brains, and technology to build a company in his homeland and compete with the big boys. And India’s making it a better and better place to do that everyday. And more and more Indians are willing to move back to their homeland to take advantage of these opportunities. Of course, India still has a long way to go. The Economic Freedom Index of the World published by the Frasier Institute in Canada still ranks India a paltry 67th. To move they will need to change in labor laws to weaken the power of the unions, continue efforts at tax reform, make India even more friendly to foreign investment while reducing regulation much, much more. With these changes, Mumbai could become the next Hong Kong or Shanghai. The hardy and remarkably able denizens of Mumbai’s slums do not need Western pity. On the contrary, they need the freedom to build their own lives and fashion economic opportunity out of little more than hard work and a clever turn at a business. Westerners need to scratch beyond the surface of the films and superficial criticism. They need to see the real stories of heartbreak, innovation, and perseverance that make these harsh and unbending slums potential incubators of economic dynamism — reflecting the very optimism that made Slumdog Millionaire such an attractive film. Samuel R. Staley, Ph.D. is director of urban policy at Reason Foundation (www.reason.org) and co-author of Mobility First: A New Vision for Transportation in a Globally Competitive Twenty-first Century (Rowman & Littlefield, 2008).